Adventures in Kindness | Leon Logothetis . Leon Logothetis went into the family business, filling his days brokering deals in the shipping industry. From the outside looking in, he had everything. But, from the inside looking out, he was dying a little bit more every day, fiercely lonely and falling apart. So, he made a radical decision to walk away from the family business, away from the legacy that had been laid out before him to carve his own path. That led in first to travel across America without cash, sustaining himself only on the kindness of others. This journey into the heart of kindness became a film and then led to a round-the-world kindness adventure on a motorcycle, but this time, the stakes were raised. Not only could he only live on the kindness of others, he also committed to giving back along the way. That journey became the basis of a book and then The Kindness Diaries series, which can now be seen on Netflix. 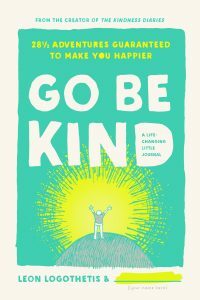 And, Leon has a new book out called Go Be Kind, that is more of a daily journal of fun and easy ways to be kind. So excited to share this conversation with you today. ThirdLove: Go to ThirdLove.com/GOODLIFE now to find your perfect fitting bra… and get 15% off your first purchase.